Palmetto Bay Movers – Are you moving? The who process can be very overwhelming. 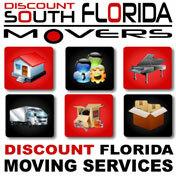 At Discount South Florida Movers, we are here to help you. We have been moving people in and around Miami-Dade and all over Florida for over fifteen years. Our team of experts can guide you through the process. We guarantee that you will be satisfied with you move. Let us do the heavy lifting for you. We can do anything you need for the move including neatly and safely packing your belongings. Specialty items such as pianos are no problem either. Let our team of professionals take care of all of your home or office moving needs. Palmetto Bay is a village in southern Miami-Dade County. Incorporated recently in 2002, they boast a population of 23,000. Given that there is less than 9 square miles, they are a little bit more than twice as densely populated as the rest of the county. The village gives full access to all of its council meetings both on cable TV and streamed online. Some of the attractions are their original houses. The Charles Deering Estate is a center for cultural events. It’s also the site of many weddings and private celebrations. There is also the Thalatta Estate Park which is a park built around a Mediterranean Revivalist type mansion. Burger King’s headquarters used to be located here as well. Discount South Florida and Palmetto Bay movers provide low rates on residential, commercial, piano and long distance moving.